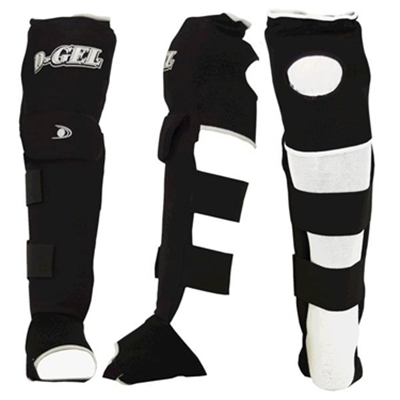 Our #1 selling and recomended knee & shin guard solution. 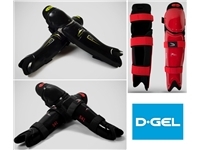 Deluxe leg guards offering strategic protection allowing for increased freedom of movement in a sprint. D-Gel® offers full protection thanks to a thick foam rubber that absorbs shocks. Covered by a resistant plastic protector. Two elastic velcro bands and foot stirrup provide secure and superior adjustment. Pads will be very tight but will stretch some for players with larger knees and velcro straps can be a little short on players with "thick" calves. A quick measurement shows that calve circumferences greater than 24"could be an issue. When changing sizes, the only thing that changes is the shin portion which changes 1" in length for every size. One pair of pads per order. Combination knee / shin pads for serious broomball protection. Polyester breathable square mesh body with embossed branding. High impact 1/2" absorbent foam. Covered by strong plastic shield protecting tibia and knee. 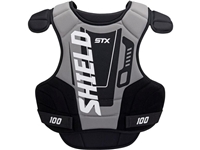 Foam gives additional protection on both sides of the knee. Fully elasticated knee back for a perfect fit. 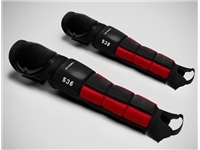 2" Elastic shin straps with front fastening velcro tabs. Machine washable in cold water and dry on low heat cycle. 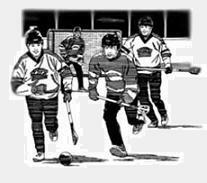 Adult Small Less than 5'-0" 10" 17"
Adult Medium 5'-2" to 5'-4" 11" 18"
Adult Large 5'-5" to 5'-9" 12" 19"
Adult X-Large 5'-10" + 13" 20"